It is an extended version of JSF h:commandLink with Ajax, partial processing and confirmation feature. It is used to create a link which redirects control to specified target. 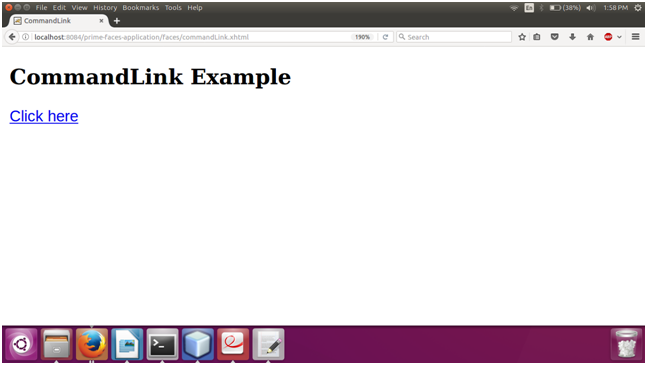 The <p:commandLink> component is used to create a link in JSF application. It has various attributes that are tabled below. value null String Href value of the rendered anchor. action null MethodExpr/ String A method expression or a String outcome that'd be processed when link is clicked. process null String Component(s) to process partially instead of whole view. ajax true Boolean Specifies the submit mode, when set to true(default), submit would be made with Ajax. update null String Component(s) to be updated with ajax. global true Boolean Defines whether to trigger ajaxStatus or not. resetValues false Boolean If true, local values of input components to be updated within the ajax request would be reset. timeout 0 Integer Timeout for the ajax request in milliseconds. type null String Type of resource referenced by the link. form null String Form to serialize for an ajax request. Default is the enclosing form. 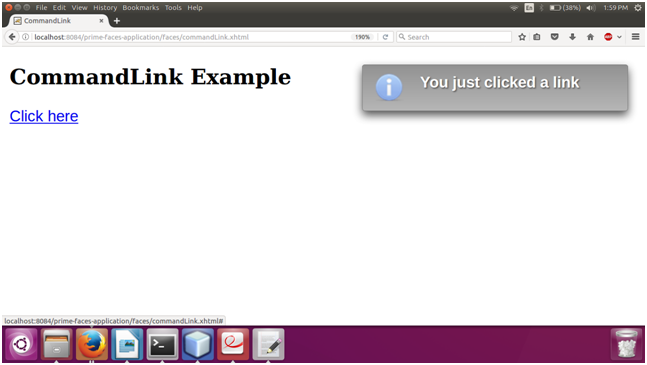 Here, in the following example, we are implementing <p:commandLink> component. This example contains the following files.